Yes, you read that title correctly. I finished up a mountain of products on this trip to Ixtapa, and there’s absolutely no chance I’m toting trash with me home. Since I won’t be doing my usual empties video talking through each item, I thought I’d just share some quick thoughts on these mostly awesome and beach-ready products. 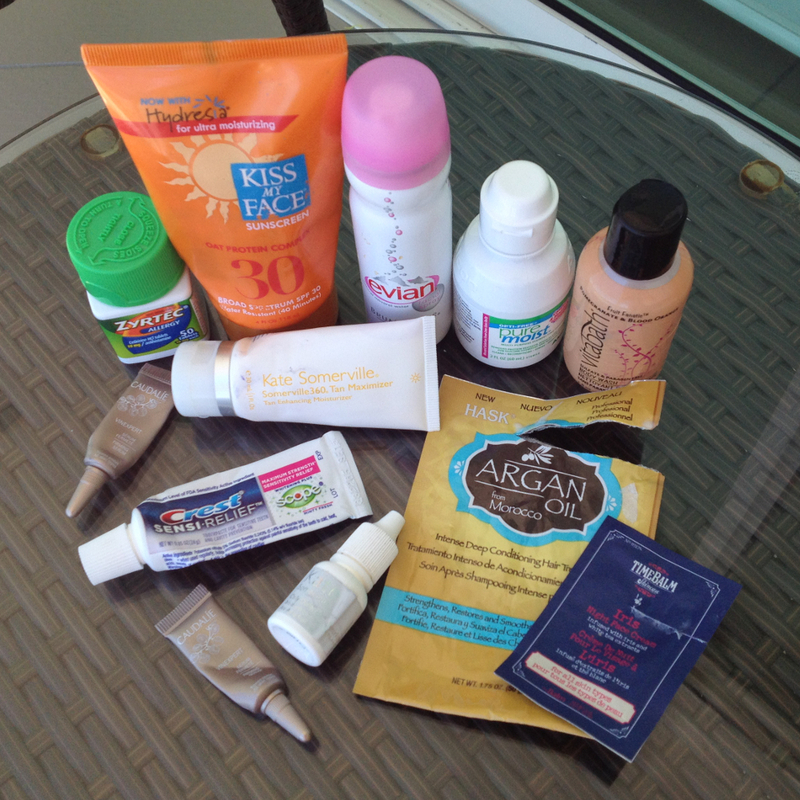 Admittedly, some of these travel size products I’m sad to part with. One of my long time favorites and flight essentials; the original, pure facial mist. Bummed I ran out because no I have nothing for the return flight home! This product really surprised me since I’ve finally found an awesome sunscreen with titanium dioxide and zinc oxide as the active ingredients. Ridiculously long name aside, I used this as my facial sunscreen and it worked wonders. With a fluid-like texture similar to Kiehl’s or La Roche-Posay’s highly raved about sunscreens, this is a slightly more luxurious option. Lightweight and absorbs quickly, never feels greasy or thick. Also, I’ve never used a sunscreen with four pluses in PA++++! This was a fantastic after sun lotion that smelled good and felt very nice on my skin. Only crutch? The hefty price tag. This was deluxe sample I scored so I used and loved every last drop. In contrast to the Kate Somerville sunscreen, this one has a real lotion texture to it. At home I was using this as my daily facial SPF, but here I switched to using this on my body and that’s why it’s now empty. This sunscreen is paraben-free and contains active ingredients oxtinoxate, octisalate, and zinc oxide. This didn’t make it to my holy grail sunscreens list, but it’s something I would purchase again. Liked it, but didn’t love it. I saw a few reviews on Sephora mentioning that it was causing breakouts and I think I may have had a similar reaction when a lot of small pimples appeared on my forehead. A few days after these samples ran out, my skin miraculously cleared up, so I think this product was the culprit. While this was a nice night cream, it’s not my favorite. The formula is rich, yet doesn’t feel like it’s hydrating my skin. Right now I’m still really into my Egyptian Magic and organic unrefined coconut oil as nighttime moisturizers since they hydrate my skin immediately. This body wash smelled incredible and truly lingered on for hours after your shower. Not only is this product sulfate- and paraben-free, it contains antioxidants that awaken your senses. It suds up to a real luxurious lather too, so I would totally buy this again and recommend it if you’re switching to more chemical-free products. Can you believe that this little packet lasted me four uses on vacation? I’m convinced that the Hask deep conditioner and the shine oil I used while in Mexico were the products that helped my hair air dry to a silky and smooth finish. I usually have some trouble with frizz when air drying my hair, but not with Hask products. The deep conditioner didn’t rinse clean as quick as I’d like, but it was overall a great product. Check out my recent review of some of their other products. Another travel and at-home essential obviously, but I had never tried this gentler formula toothpaste before. I liked it, but I don’t think it gave the most optimal clean feeling. As long as I have mouthwash on hand, I’d consider buying this product again. Another everyday essential, I ran out of my allergy meds towards the end of the trip but luckily have a Costco 2-pack waiting for me at home. Allergies… ain’t nobody got time for that! Not my typical contact lens solution, but something from the same label. Running out of this gave me an interesting challenge of navigating a Mexican pharmacy for a replacement! And that’s that. Though I have packed up empties on trips before, this amount of products on a 11-day holiday was a little ridic, so into the trash & recycling they go! 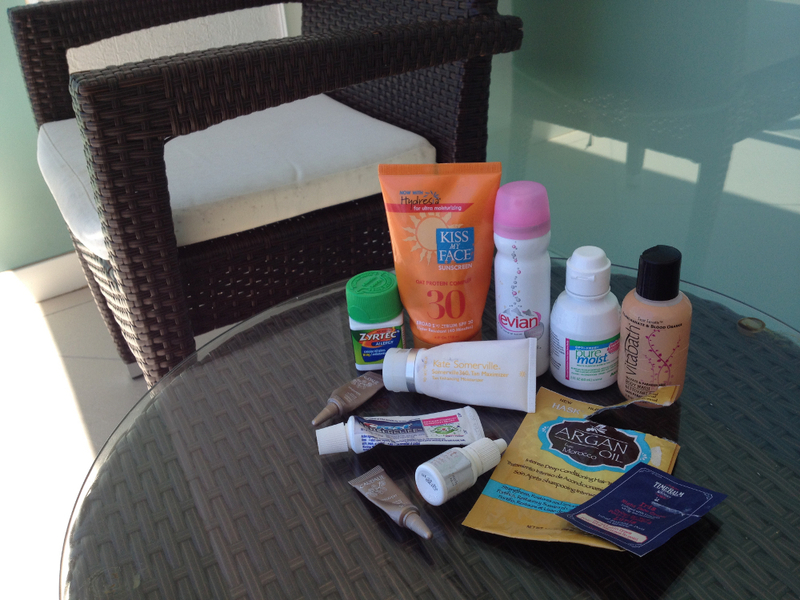 FTC disclosure: I received the VitaBath and theBalm products in gift bags at events. The Hask deep conditioner was sent for consideration. The OptiFree solution was a sample from my optometrist. I am not compensated for mentioning these products and this is my honest opinion. Cool concept for a post! I can’t even imagine what it would be like to find solution abroad, so kudos for braving that one. Luckily, the lady understood my gestures towards my eyeballs and found me the right stuff, in pesos too! Thanks for checking out my blog, Jackie!